Today, I’d like to speak about how can I implemented Auto Deploy in my environment vSphere 6.7. You must install Auto deploy on your management layer. All services must connect or reachable on management layer. 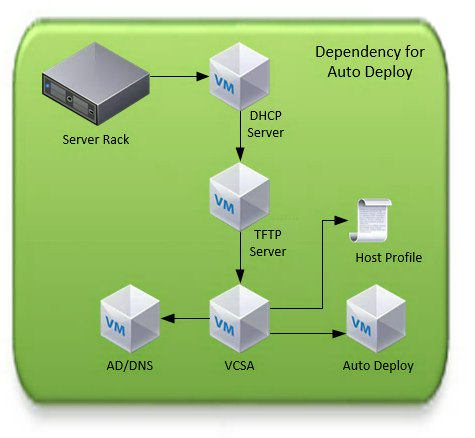 vSphere Auto Deploy can provision hundreds of physical hosts with ESXi software. You can specify the image to deploy and the hosts to provision with the image. Optionally, you can specify host profiles to apply to the hosts, a vCenter Server location (datacenter, folder or cluster), and assign a script bundle for each host. First, you must run two services on your VCSA. You could start it from the Web interface with administrator@vsphere.local account or from SSH with the root account. Verify status for these services with these command line. If they’re not running, start them with –start option. After that, you can download the PXE image on configuration for Auto Deploy in the web interface. Unzip files and copy them into TFTP folder. You can copy the value “Bios DHCP File Name”, this value must be added with 67 option on your DHCP server. Then, configure your DHCP server. You must add option 66 and 67. Next, you can add DNS entry for all of your hosts. Then, You must create a host profile. for more information you can follow this link. Please note, you can change Image system caching here, for more information, please follow link. Make sure you don’t have any fixed IP address for any VMkernel configured in Host Profile. Next, You could add rule on your vCenter server. You must upload an image in “Software depot”. 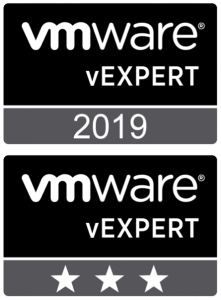 This file can be download from the VMware web site. Please downloaded Depot file with all sources of ESXi6.7. You can verify available image profile in your depot file downloaded previously with PowerCLI. Then, you can add rule for déploiement in “Deploy rules” tab. You can use a lot of the patterns matches with rule or if you prefer you can add all hosts. I recommend you look at all possibilities, here’s all patterns. Vendor : Machine vendor name. Model : Machine model name. Serial : Machine serial number. ipv4 : IPv4 address of the machine. ipv6 : IPv6 address of the machine. mac : Boot NIC MAC address. Asset : Machine asset tag. oemstring : OEM-specific strings in the SMBIOS. Now, you can boot your Server. But you need boot witout UEFI as well as plug your hote in your management layer. You could validate your configuration with a Virtual Machine with his network card on Management layer.